Prepare your photos for emailing. Resizes all images in the folder at once. My new digital camera produces images of 3712 x 2088 pixels, much too big to be sending by email to anyone. At first I was loading each image into Windows Paint for resizing, but quickly tired of that. Then I searched the web for a handy little free utility that would resize all the images in a batch. The first I downloaded did them only one at a time. The next did them in a batch, but the images had the jaggies - useless! The one after that wanted to convert the aspect ratio of my HD images to the old 4:3 standard for some strange reason. The next wanted to install itself, something that always makes me nervous. I don't like installing things on my computer if I can avoid it. I installed it anyhow, then it turned out to be a free 30 day trial only, and that has long expired. Finally, I decided to create my own, and share it with you. It is very simple, sufficient for my needs. Not only does it handle jpeg images, but png, bmp, gif, and tiff as well. The resized images are saved in the same format they came in, and the aspect ratio is maintained. Jpeg images are recompressed at a high quality level (95%). Simply download and unzip the application into a folder you prepared to receive it. 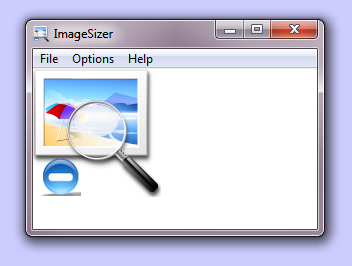 You may want to create a shortcut to ImageSizer and place it on your desktop. Be sure you select the desired size in the Options menu before you begin, then simply navigate to the folder with the images you want to resize. The operation begins when you click "Ok" in the File Open dialog. A preview of each image is portrayed as each resized image is created. When the previews stop flashing by, the job is done. A new folder called "Resized" will be created in the folder with the original images, and you will find the resized images there. This utility was created on Windows 7, 64 bit version, and tested on Windows XP SP3. It should therefore work on XP, Vista, and Win 7, 32 or 64 bits. However, testing on Windows XP revealed that it could not create gif images. In any case there is a limit as to how much you can enlarge images that are already very large. If you have any comments or questions you may email me here.